There was something magical about this memory, eliciting for me hot summer days, dusty roads, and wildflowers along the verge. It is the magic of childhood, and more specifically, of a childhood spent outdoors. Having read this lovely memory, I wondered if other South Hero Land Trust members would be willing to share their own stories with me. Over the next several months I was lucky enough to collect some wonderful memories. 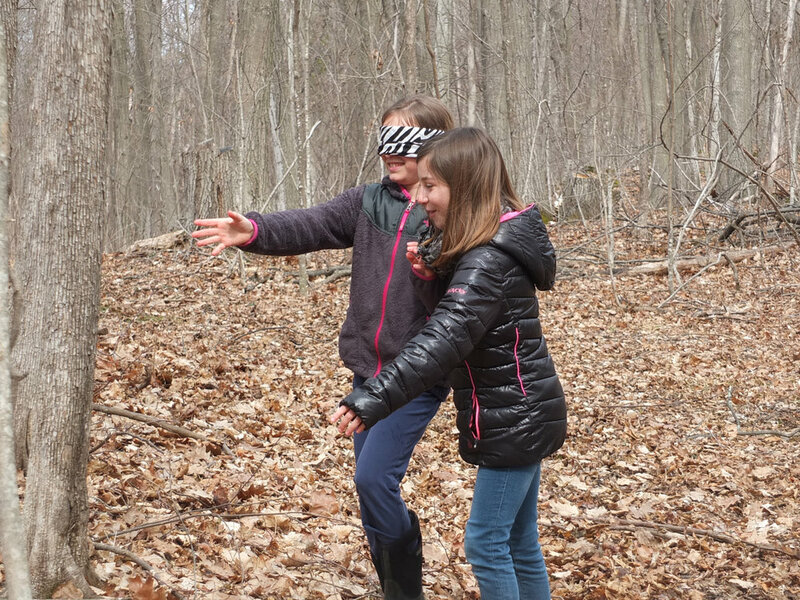 Two girls have fun and learn to “see” trees in a new way on Fox Hill at Crescent Bay Farm. Richard Bingham and his family began coming to South Hero in 1938, at the end of the Great Depression. They rented a cottage next door to Martha Cushman’s family. He says that “life at Camp Cedar Cliffs was just wonderful.” There were three families who came every summer for many years. The Binghams would arrive around Memorial Day, when the lake was still cold. It would be a big event to get into the water right away. The McConnells had two boathouses and two outboard motorboats, as well as a big inboard boat called the ‘Merrimack.’” Each summer the three families would make an event of taking a boat to Cedar Island or Savage Island for a picnic. Savage Island had a sandy beach where they would hunt for “moonstones,” gathering all the “little polished quartz pebbles tumbled by the sand.” They would go fishing and catch huge buckets of perch, clean them, roll them in cornmeal, and have a big fish dinner. Thirty years later, Steve Robinson was a farm boy in South Hero. “We’d bike to White’s Beach and swim all summer long. We’d take a piece of driftwood and float far out into the bay.” Steve also remembers playing Little League baseball, camping on Fox Hill with the Boy Scouts in winter to earn his Polar Bear merit badge, and duck hunting with the principal of Folsom School. Time to be wild and explore the woods and other natural places is an important part of childhood in a rural community like South Hero. 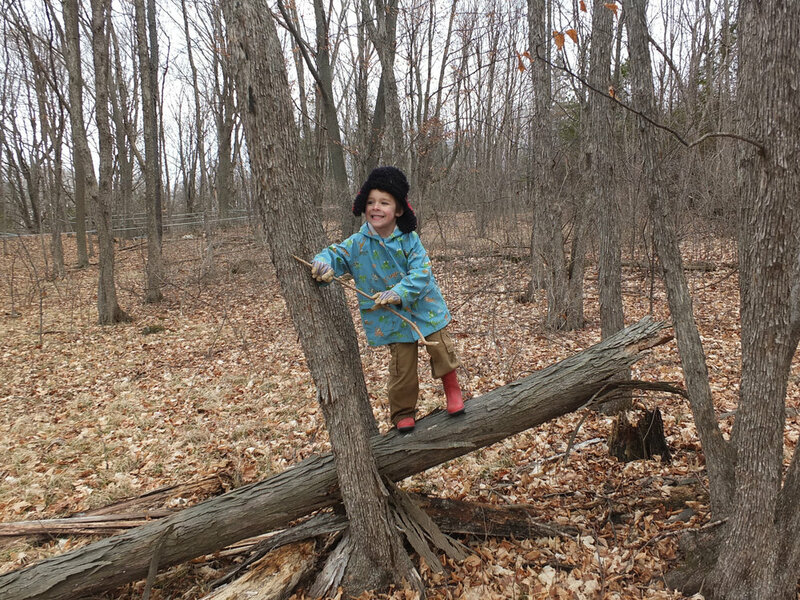 The Land, the Farms, and Me is one way that South Hero Land Trust has helped make sure that children in South Hero are still experiencing the magic of a childhood outdoors. The community trails we have protected and built help ensure that children and their families have access to outdoor spaces near home for exploration, recreation, and learning. Beginning with the Round Pond Natural Area in 2001, and looking forward to the opening of the Tracy Woods Trails soon- we work hard to make sure that these spaces are protected for generations to come. Through our Naturalist Walks and other programs, we encourage community members to get outside and explore the land with us. We are proud to work with the local community to protect the places where children and community members of all ages get outdoors, and experience the magic of exploration and play in the woods. These stories from Martha Cushman, Richard Bingham, Steve Robinson, and Silva Warren show how access to nature- whether in your own backyard or to the beautiful lake surrounding us- is an essential part of childhood in South Hero, and something well worth protecting. Thank you for being a part of this journey, and protecting these special places with South Hero Land Trust. What are your favorite memories of childhood, whether in South Hero or another special place? I would love to hear your stories. Email me at emily@shlt.org. On September 7th a group of middle school students from South Hero did something a little different. It was a Wednesday afternoon, and instead of being in the classroom, studying the formation of the planet, or learning the basics of algebra, they got one a bus and rode to Pomykala Farm in Grand Isle. They were there to meet Koi Boynton and Hannah Baxter, two gleaners with the Healthy Roots Collaborative, to harvest corn on the farm. Hannah had spoken to Ben Pomykala two days earlier. Ben said that they had finished harvesting the sweet corn for the year, but there was still plenty in the fields. It was a little small, but perfectly good eating. Would Hannah bring some volunteers to pick the corn and bring it to one of the food shelves in the region? Hannah knew this would be a perfect job for these students. It would be a great way for them to learn more about where the food they eat comes from, and to get a better understanding of some of the challenges that families in our community face, like buying enough food to get through the month. The students stripped the field clean, packing the corn into boxes. The corn was then taken to Islands in the Sun and Saint Amadeus Church in Alburgh, and from there to our neighbors’ tables. The Healthy Roots Collaborative (HRC) has been working with farmers in Grand Isle and Franklin Counties to harvest extra fruits and vegetables and distribute them to charitable food sites in our community for three years now. South Hero Land Trust has been a member of the Collaborative, and worked with Collaborative staff and volunteers on this program since it began- making connections with Grand Isle County farms, charitable food organizations like Food for Thought and CIDER, and local volunteers to help with the harvest. HRC worked with 10 farms this year, and distributed food to six sites in our county, serving primarily families with young children and seniors- the two most vulnerable populations in our region. Hannah Baxter, Gleaning Coordinator for HRC, says that most farms have “unofficially woven giving back to the community into their business plans,” and many have giving to the Vermont Food Bank or local food shelves for many years. HRC is there to make that easier, by harvesting the produce with volunteers, and delivering it right to the recipient sites. Pomykala Farm has been a critical partner in Grand Isle. They were hesitant to have HRC come to the farm at first, they were already donating to the Food Bank. “But when they saw the volume of vegetables that HRC could take, and the effort we made to distribute it, all while making it easy for them…” says Hannah. “they became our most regular partners. Hannah wants to be clear- HRC is providing a great service to farmers and charitable food sites, but the farmers are the ones donating the produce- it is their generosity that is feeding our neighbors. One of Hannah’s favorite parts of the program is getting kids out on the farm to glean. She helps organize field trips for local schools and camps. She says it is a great learning opportunity, as well as a chance for kids to make a difference in their own communities. There is no better way for kids to learn about hunger, and where their food comes from, than gleaning on the farm. And if they can do something about hunger in their own community at the same time, the message is that much more powerful. Hannah says that the kids ask a lot of questions and that you can “really see them thinking” about what it means to help each other. South Hero Land Trust is proud to be part of this important work in Grand Isle County! If you’d like to learn more about the Healthy Roots Collaborative Gleaning Program visit http://healthyrootsvt.org/what-we-do/ or contact Hannah Baxter, Gleaning Coordinator, at healthyrootsgleans@gmail.com. While there have been farms in the Islands for generations, before 2005 it was hard to find fresh local food in the South Hero and Grand Isle. The few farm stands that existed were small and farms relied primarily on wholesale markets. Island residents and visitors didn’t have good ways to connect to local farms or pick up food grown by their neighbors. At the same time, the community recognized that places to gather, and to celebrate food and community, were few and far between. But then a group of dedicated farmers and community leaders came up with an idea to solve both of these problems. A small farmers’ market had been operating in Alburgh for a couple of years, and they decided to work with South Hero Land Trust to bring a farmers’ market to South Hero. From an ad-hoc market by the town garage led by volunteers to a successful nonprofit organization with two locations and a growing list of vendors, the market has come a long way. Christine Bourque of Blue Heron Farm was instrumental to this process, serving as the new Champlain Islands Farmers’ Market’s board chair for many years. Amanda and Hugo also feel that the market gives them a chance to give back to their community. “Our market prices are competitive with grocery stores. We have to make a living as farmers, but we also want to feed our community.” The market board also recognizes the importance of welcoming community members of all income levels to the market, and they accept 3SquaresVT (food stamp) dollars, have a strong Farm to Family Program (for WIC participants), and make other efforts to help everyone get fresh vegetables and fruits at a price they can afford. This year the market is partnering with C.I.D.E.R to provide a shuttle service for those who need transportation to the market. For residents, visitors, vendors, farmers and businesses alike, the farmers’ market has become woven into the fabric of this community. As Christine Mack says, the market helps connect different kinds of people. The summer residents get to know the year-round folks and feel like they are part of the community.” From its humble beginnings it has grown into a gathering place where farmers and craftspeople can connect with customers and grow their businesses, where everyone is welcome and where all can come together to celebrate food, community, and friendships. Amanda and Hugo Gervais love bringing their kids to the market with them. “Our kids have grown up at the market. They have their market-friends, and they get to sell their crafts and be young entrepreneurs.” The market hosts special activities for children, like the popular “Kids’ Market” and art activities with South Hero Land Trust. Families come for a meal together after a swim at the beach. Everyone finds fresh vegetables, eggs, and meats; yummy desserts and breads; and unique crafts found nowhere else. 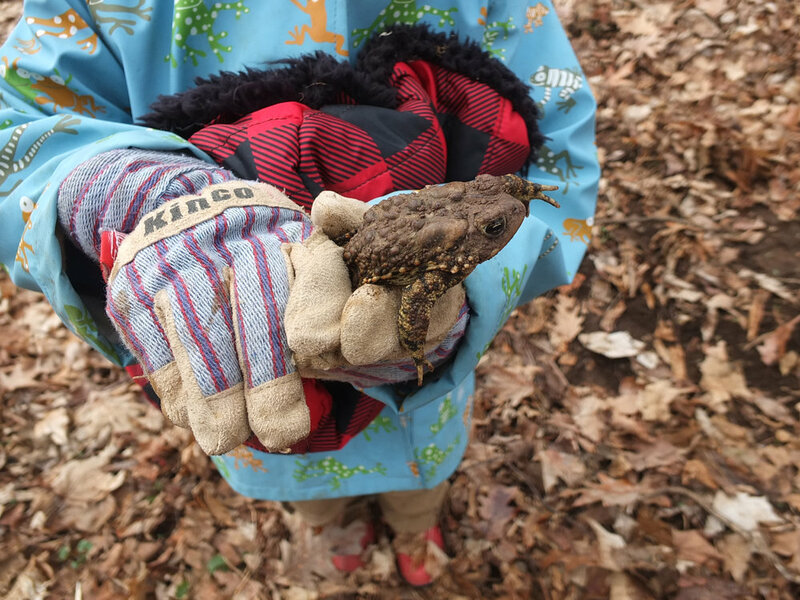 Naturalist Sean Beckett, a regular teacher in our Naturalist Walks Program, explores the world of "things with wings" at Round Pond Natural Area. But when Chuck told his high-school guidance counselor he wanted to be a naturalist, he was told to focus on getting a “real” job. Chuck was upset, but in college he found a passion for biochemistry, which allowed him to explore the science of the natural world. But after a life-threatening accident, he realized that he wasn’t helping people while working in a lab. He decided to focus on getting a medical degree and became a doctor. Chuck loved being a doctor and helping people get healthy. But while he could help his patients recover from illnesses on a case by case basis, he wanted to make a difference in the larger realm of human health, and improve behavior around healthy lifestyles. Partway through his career, Chuck learned about a new field of study looking at the impact of nature on human health and well-being. Research showed that not only can nature make us feel happier, spending in nature contributes to your physical well-being, including measurable impacts on reducing blood pressure, heart rate, muscle tension, the production of stress hormones, and more¹. How perfect! Chuck had found a way to combine his passions for nature and human health, and in addition to continuing as a clinician Chuck took a job in the Rubenstein School at UVM. For Chuck, spending time in nature had always been a curative, and he was thrilled to be a part of a field that was showing the actual medical benefits of going for walks in the woods. Community members learn to identify fall wildflowers on a walk with Chuck Hulse. After all these years, Chuck gets to be a naturalist after all, and he is hard at work following his passion. He volunteers to survey and protect rare plants, leads naturalist walks in South Hero, writes a wonderful blog about nature in the Champlain Islands, and continues to learn and develop his skills as a naturalist. He is also helping SHLT establish a Master Naturalist Program. As Julie says, “Dave’s parents were great mentors for us. We were very excited about farming and wanted to buy the farm right away and start on our own, but they slowed us down and really made sure we knew enough to be ready, to be successful.” By 1998, Fred and Gladys knew that Dave and Julie were ready to take on the farm, but they didn’t know how to transfer ownership to them. The younger couple had two growing sons and they weren't sure what the next plan for the farm should be. The price of land made the farm seem out of reach, and it could have been lost forever. The whole family works on the farm now. Dave and Nick continue to work off farm jobs, but spend many winter days in the sugar bush and summer days at the winery. Alex began working in the vineyard during high school, and he continues to work there now, caring for the grape vines. Julie manages the tasting room and bed and breakfast. The whole family is around in the spring for maple sugaring. They sell their wine and maple syrup at the Snow Farm tasting room, Champlain Islands Farmers’ Market, and Burlington Farmers’ Market, as well as at regional stores and restaurants. What was once a traditional Vermont dairy farm has been transformed into a diverse family business that welcomes the community year-round. Julie was an elementary school teacher for many years, and remains committed to making connections between education and farming. They host field trips for students from Folsom School, walks with South Hero Land Trust, and invite the community to stop by in the evenings during the sugaring season. Julie says, “People need to understand place, and that takes visiting a place again and again, learning more each time.” She and Nick are always happy to pause during their day and talk about what they do, and the importance of family farms in Vermont. Land conservation helped the Lane family transform their farm in a way that has impacted many people beyond themselves. Dave, Julie, Nick, and Alex have remained committed to South Hero, and demonstrate this commitment through their careful stewardship of the land; by welcoming community members into the sugarhouse, vineyard, and trails up Fox Hill; and through their eager participation in civic life. Their farm has become a community gathering place, where we can celebrate farms, families, and our special Island life. Outdoor spaces, from the edge of a stream to a wooded hillside, are important places for children. There are plenty of fallen branches, pine cones, leaves, and other materials to collect. There are hidden worlds to discover as they get a little older. Anne remembers building fairy houses in a mossy grove, just feet away from her grandfather, but feeling independent and brave. Those same branches become building materials later, and the tadpoles in the stream become science projects. There is no better way to encourage children to grow up to be naturalists and scientists (whether it’s a profession or a passion) than to let them explore and learn about the natural world in their own backyard. And time spent with a mentor- like Anne’s grandparents were for her- can be equally valuable. Adults need wild places too. We all face challenges, worries, and fears in our lives. The woods can help us find a sense of calm. I know that when things seem to be moving too fast in my own life, a wander through the woods help me slow down. And while the trees don’t actually speak to me, I often find solutions to my worries while walking or running along a wooded path. It’s these feelings the Tracy family wants to share with the South Hero community, today and into the future. Anne says the Woods were a “magical place to grow up, to be a child and explore. And that’s what I want other children to be able to do. To have these woods as a place to come with their parents and go on walks, or come with their school group. To get up into the woods and explore. To learn to love, appreciate, and protect the natural world.” And for adults? She says that to be someplace where we can set aside the worries of the world, “and just be still and breathe and listen,” is something that helps bring a sense of peace and well-being back to our everyday lives. Neighborhood children already play in these woods, building forts and fairy houses, visiting the giant hemlock trees, and looking for frogs and birds’ nests. Adults walk here, seeking peace and renewal. So when Anne, along with her father Hobart Tracy and his wife Naomi King, came to South Hero Land Trust, wanting to explore the path of land conservation, I was eager to protect this special place. For the family, this is a way to protect a place they love. As Hobart told me, “this has always been our family homestead, and it’s important to keep it that way. Conserving the land makes that possible.” It has become clear that our community feels a connection to this land too, and I am so grateful to the many community members who gave gifts to make this project possible. We completed our fundraising campaign (with our partners at the Lake Champlain Land Trust) this fall. Thank you for being part of this special project. When the Woods are conserved and the new trails open, the whole community will be able to enjoy this beautiful place. I hope you’ll join me next summer, for a walk in the woods. 50 students, in grades 5-8, wrapped up a celebration of the new school year with an afternoon of projects that will help make their community a better place for all. From building a new bridge at Round Pond Natural Area, to gleaning watermelon and other vegetables at Pomykala Farm, the students were living examples of Folsom’s three expectations: take care of yourself, take care of others, and take care of your community. Several of the students headed up to Pomykala Farm to glean with the Healthy Roots Collaborative. They harvested over 1,000 lbs of watermelon, lettuce, and parsley that was not up to market quality, but was perfectly fresh and healthy to eat. The produce was donated to the Champlain Islands Food Shelf, the CIDER senior meals program, and three charitable food sites in Franklin County (continued on page 23). Two groups of students spent the afternoon on the trail. At Round Pond Natural Area students replaced a foot bridge that had begun to rot. As community volunteer Peter Zamore said, “it’s great to see Folsom students working together outside of the classroom, and learning hand-on basics about carpentry skills, trail maintenance, and maintaining the natural surroundings.” Students measured, cut, drilled, and assembled a new foot bridge near where the trail ends on the shore of Lake Champlain. The rest of the trail building students headed to the Water Wigglers Trail behind Folsom School, and cleared a overgrown sections of the boardwalk and nature trail, opening it up for students and families to use this year. The students walked away with a clear sense of civic participation and pride, knowing that they can help create the community that they want to live in. South Hero Land Trust can’t wait to work with them on more projects in the future! Many thanks to Rob Swanson for taking these and many other great photographs of the students during the community service day this fall. Have You Met South Hero’s Newest Farmers? The Landon Farm has a new vibe these days, and we are so excited about it! Farmers Phelan O’Connor and Kelsey Chandler have just moved to South Hero and are buying the Landon Farm. We hope that you’ll enjoy getting to know them as much as we have, and give them a big welcome to our community. After being introduced to farming at Warren Wilson College, and several years of farming with Fairfield farmers Tyler & Melanie Webb at Stony Pond Farm, an organic dairy and beef operation, Kelsey and Phelan are bringing their operation, Pigasus Meats to South Hero. Phelan, Kelsey, and their dog Jenny will be living full time at the farm, and look forward to being South Hero community members. "We fell in love with farming during our time together at the Warren Wilson College Farm. Through our experiences there and working since then with other farms... we became committed to farming as our life's work." Kelsey and Phelan began Pigasus Meats in 2013, on leased land in Fairfield. Right away, they wanted to distinguish their product and introduce customers to it in a fun way. So Phelan got busy in the kitchen, developing signature recipes for their beer bratwurst and lemon and herb sausage. Their breakfast sausage, developed by Vermont Artisan Meats, became a star product at the Burlington Farmers’ Market. Each Saturday they would load up with pork, fresh bread, eggs, and a grill, and sell breakfast sausage sandwiches at the market. They also sold packaged retail cuts for customers to take home. By the second year they were selling out every market, and they needed room to grow. By 2015, Kelsey and Phelan were ready to purchase their own land. While looking for land for their farm, Kelsey enrolled in an accelerated nursing program in Massachusetts, and began working as a nurse at the UVM Medical Center in April. They also began working with Sam Smith, a farm business planner at the Intervale Center, who helped them assess and improve their business skills and farm plan. As soon as Kelsey got her nursing certification the couple came back to northern Vermont and began to search in earnest for a permanent home for Pigasus Meats. This is where Vermont Land Trust, the current owner of the farm, and South Hero Land Trust got involved. "We see farming as a way to be proactive stewards of the land, provide humane animal husbandry, produce high-quality food products through a pastured system, and engage actively in our community. We are very excited and honored to make our home in South Hero and become members of its agricultural community." During the winter of 2016-17 the tenants of the Landon Farm, East Shore Vineyard, made the difficult decision not to purchase the property. VLT and SHLT wanted to provide any new farmers of the land the opportunity to take advantage of the summer growing season, so we initiated a search for new farmers right away. VLT staff Jon Ramsay approached several farmers enrolled in VLT’s Farmland Access Program whose farm plans were a good match for the land base, and invited them to visit the farm and submit proposals for buying it. After a careful process, VLT and SHLT staff selected Pigasus Meats to buy the farm. "It is exciting to have Kelsey and Phelan as stewards and owners of the Landon Farm. We have confidence that they will bring a vibrancy to both the Landon Farm and to South Hero." The Landon Farm provides Pigasus Meats with a great opportunity to invest in their own land and grow their business. With acres of pasture and woodlands, the Landon Farm is well suited for a diversified grazing operation, and Phelan and Kelsey plan to raise pastured pork and laying hens on the property. Pigasus Meats' goal is to build soil fertility while raising high quality pork and eggs, which they hope to sell through local farmers’ markets, retail outlets, and eventually a new farm-stand. Kelsey, Phelan, and their dog Jenny moved to the farm in early May 2017. Their first pigs arrived soon after, and are happily grazing in pasture near the farmstead. We are lucky to have Kelsey and Phelan joining our special Island community! Springtime bloom at Hackett’s Orchard fi lls the air with the sweet small ofapple blossoms and the hum of bees. South Hero’s apple orchards hold a special place in the hearts of many Islanders, young and old. As children growing up in the Islands, fall trips to Hackett’s Orchard and Allenholm Farm to pick apples were sacred- the orchards seemed to sit outside of time, trees heavily loaded with crisp sweet-tart apples and the smell of cider donuts. From picking apples in the fall and seeing young calves in the fields in spring, to swimming lessons at White’s Beach and skating at the Sandbar, there are special places that make South Hero home for us. Ron and Celia Hackett, who’ve owned Hackett’s Orchard since 1967, have introduced generations of children to apple picking. Hearing their stories over the years, from when they first arrived at the orchard, and “didn’t know one apple from another,” to the day they sold their first pie, was very special for us, and we hope you will enjoy reading some of their story here. Ron and Celia both grew up in the Northeast Kingdom. Ron’s father owned a dairy farm, a small sugar bush, and a potato farm in Albany, VT. At one time Ron anticipated taking over the potato farm, but life took him in a different direction. He married Celia and began a career with Bell Telephone Company, where he worked on the dial conversion of Vermont towns (allowing phone users to dial a number directly, rather than through an operator). They lived on a “postage stamp” lot with their two young daughters, Deb and Jill, in Essex Junction. As the girls grew, the home felt smaller and smaller; they wanted to get out of the suburbs. When they learned that the Larrow orchard in South Hero was for sale, they decided to make a change. They bought the property in March of 1967 and got to work. The Hacketts now sell all of their apples and cider at their on-farm store on South Street, and host thousands of children on school field trips each fall. The first year was hard. Ron had helped in the orchard a few days the previous fall, but they were otherwise untrained. They had a heavy bloom in the spring, which would usually be thinned with a chemical spray so that the trees produce big red apples. But as Ron says, their first spray salesman didn’t have faith in Ron’s ability to do anything properly. So he recommended not spraying and Ron didn’t know any better. As a result, they had a tremendous crop of small green apples, not a one as big as three inches, and few turned red. They kept working and learning. A new spray salesman came along and took Ron under his wing. He helped with the spray schedule and taught them to monitor for scab and insects. He and the UVM Extension’s tree fruit specialists were important mentors. Ron worked for the phone company for the first 19 years, spending weekends and evenings in the orchard. He took all of his vacation time during picking season. They picked the apples into bushel boxes scatted throughout the orchard. Ron would come home and take the tractor to collect the boxes, often working until dark. They hand graded one bushel at a time on a table in the shop. Ron gives Celia credit for keeping things together; driving tractors, caring for the pickers, grading the apples, raising their kids, looking after the house- she did it all. In the 1960s, most apples at that time were sold by route; orchardists like Ray Allen and Alan Kinney would go door-to-door selling apples all day. Ron and Celia sold most of their apples wholesale at general stores. They also sold apples to Carpenter’s Apple Cider in Colchester, at 25 cents a bushel, and would buy cider back. They later bought cider from Ray Allen, and then in the early seventies Ron bought a press and began making cider at the orchard. When they did sell apples by retail, it was all by the bushel- folks buying storage apples or fruit for making pies and applesauce. Ron and Celia would set up a long line of pallets, separated into fancy and utility apples of each variety. Customers would go down the line asking for what they wanted, and Ron and Celia would load up bushel baskets. Apples for sale at Hackett's Orchard, the family grows about 50 varieties that ripen August through October. In 1990 they built the kitchen and began making pies. Ron and Celia built their farm store up and worked to start Applefest, and many people discovered the South Street orchards. They were still only picking a couple thousand bushels a year, so in 1984 they planted 4 more acres. They bought some land from Ray Allen to expand the orchard, and suddenly their sales were all retail. When they sold their first pie, Celia couldn’t believe it. “No one buys pies! I don’t buy pies, my mother never bought a pie,” she thought. But they had the pie out on the table and a man came in and said, “I’ll buy it.” She was floored, she said, that “someone bought a pie!” They went on to sell 60,000 pies by 2008. It still bothers some people that they gave up making pies. But Celia says that the apple crisps they sell now have gone over very well. They began doing Pick-Your-Own in the 1980s. It’s a lot of work to manage, but an important part of their customers’ experience. Ron says that when he goes down to the orchard on a weekend afternoon in the fall, all he hears is talking and laughing. Celia remembers a customer who pick apples at the orchard, wrote a song about it, and came back to play it for them. And now they have second, third, even fourth generation pickers coming to the orchard. They do have concerns for the future. They think about what the changing environment will mean for the orchard. New diseases and pests keep them on their feet. Climate change, and increasing variability of temperature and rainfall are hard on the trees, which need steady warming and sun for good bloom and pollination. Violent summer storms, which often bring hail, damage the trees and fruit. They can’t irrigate easily, which will be a challenge for the dwarf trees they are planting. To Ron and Celia, it never seemed like they were making major changes, but over 50 years the small changes added up. National pressures such as changes in food safety regulations have led to many small shifts. They’ve shifted from mostly selling wholesale to all retail. The farm store has brought visitors from across the country, as well as generations of school children to the farm- where they learn about farming, and leave with a special connection to the orchard and South Hero. Celebrating 50 Years of Growing Apples and Feeding a CommunityRon and Celia’s stories of their years at Hackett’s Orchard made me realize that even the places and things that I think of a constant, are changing and adapting all the time. Ron and Celia have embraced change, while remaining true to a few core values at the heart of their business. They believe in working hard, providing the community with the very highest quality product, safety for their workers and customers, in generosity, kindness, family, educating the next generation. Because of their hard work and that of farmers like them throughout the community- the orchards of South Street have come to feel like part of the very bedrock of South Hero. Many thanks to Ron and Celia Hackett for sharing these stories with us, and for their hard work over the last 50 years. And many thanks to all of the hard-working farmers that feed us, teach us, and make South Hero home.